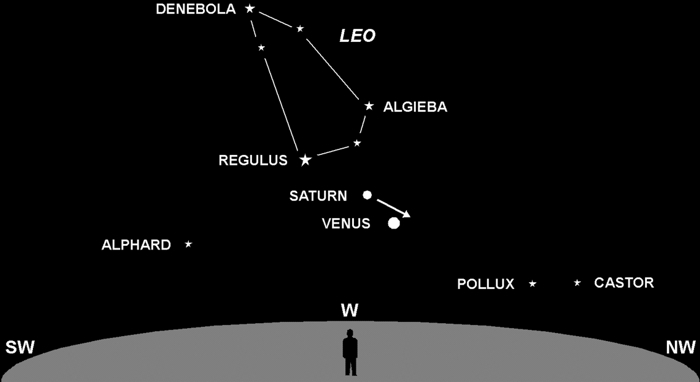 On the evening of June 30th, Saturn and Venus will reach a point known as conjunction. In astronomical terms, that means they’ll have the same right ascension (a coordinate) in the sky. In practical terms, it means they’ll be very close to each other. Over the last half of the month, you’ll see them visibly getting closer. In fact, as far as conjunctions go, this one is remarkable. For your average conjunction, this pair might be 4° apart — that’s about 8 Moon diameters. This time they’ll pass within 0.8°, or about 1½ Moon diameters. If you have binoculars, you’ll easily see them both in the same field of view. Saturn’s rings will be visible, and you should also see that Venus looks like a bright tiny crescent. Venus goes through phases much like our Moon, a fact first discovered by Galileo back in 1610. Your binoculars are of far better quality than Galileo’s telescope, so have a look. You won’t be disappointed. It is possible for Venus to pass right over Saturn, but an exact alignment is very rare. It occurs only once every few centuries. The last was August 29th, 1771. It won’t happen again until Aug 121, 2243. Variation in the separation at conjunction is a result of the tilt of the planets’ orbits. Relative to Earth’s orbit, Venus’ orbit is tilted 3.4° and Saturn’s is tilted 2.5°.